ICYMI, Wednesday was the day '80s and '90s kids have been waiting for since 1989: Back to the Future day took place Wednesday, ushering in a whole host of memorabilia, tributes, keepsakes, and celebrations of the franchise. I'm super glad the day has happened, if only so people will stop lying about what date Marty and Doc traveled to the future during Back to the Future Part II in doctored social media posts. I mean, why lie about something so sacred?! If you're as diehard a fan of the series that I am, you've probably been closely monitoring the celebrations of and the coverage surrounding this monumental day in film history. And, luckily, the Internet hasn't disappointed in either of these categories — the news surrounding Back to the Future day was plentiful and any fan's dream. Here's a round up of the best news from Back to the Future day, which will hopefully help make all your dreams come true. It'll definitely make you add a few items to your Christmas list, that's for sure. This is not a drill! The shoes you've always dreamed of (aside from, like, allllll of Carrie Bradshaw's Manolo Blahniks), are finally here according to reports! I've yet to get hold of a pair myself, but just knowing that self-lacing shoes reportedly exist and that they're are out there right now tying themselves on to someone's feet fills me with so much hope for the human race. Well done, world! Apparently, Nike sent the first pair to Michael J. Fox, because it's the law or something. I can't think of anyone who deserved a pair more, or would wear them so well. But me next, yeah? To commemorate the fact that we've finally caught up with Marty and Doc's time-traveling escapades, Thursday's edition of USA Today will feature a carbon copy recreation of the USA Today cover from the second movie. Sure, it's not quite accurate in terms of reality — three billion readers of print media is a little hopeful in the real 2015 — but it's filled with references and easter eggs that Back to the Future fans will LOVE. A review of Jaws 19 ? I'm in! You've probably seen this short clip of Michael J. Fox and Christopher Lloyd discussing what Back to the Future II got right and wrong about 2015 — but what you might not have seen yet is the full version of the video, in which Mischa Pollack meets Fox and Lloyd, and shows them how trash can now get turned into fuel for a car! Some of Back to the Future's vision was totally correct, and that's exciting to see! In an amazing video, Lloyd reprises his role of Doc Brown to bring us a special message on Back to the Future day. He says that yes, the future isn't what we expected it to be — but that's OK. It just means our futures haven't been written yet, so we best make them good ones. It's super beautiful, and I'm almost tearing up right now. *wipes away invisible tears* Thanks Doc! Whether you play GTA or not, you've got to give props to the people that recreated this iconic scene from Back to the Future. Dressing up Trevor as Doc is maybe a bit of a stretch, but the outfits are on point, and the DeLorean is totally sweet. Nice work! Lloyd, Fox and Lea Thompson reunited on the Today show Wednesday and discussed which Back to the Future predictions had come true. It was super cute to see them all back together again, and almost like no time had passed. Fans celebrated all day and were all over social media — celebs included. Back to the Future day is a holiday for all! Aaron Paul, for one, posted an Instagram with his wife, posing in front of a DeLorean while holding a boom box. #RelationshipGoals anyone? Check out this extra-special commercial featuring none other than the DeLorean flying alongside a plane. What a time to be alive! 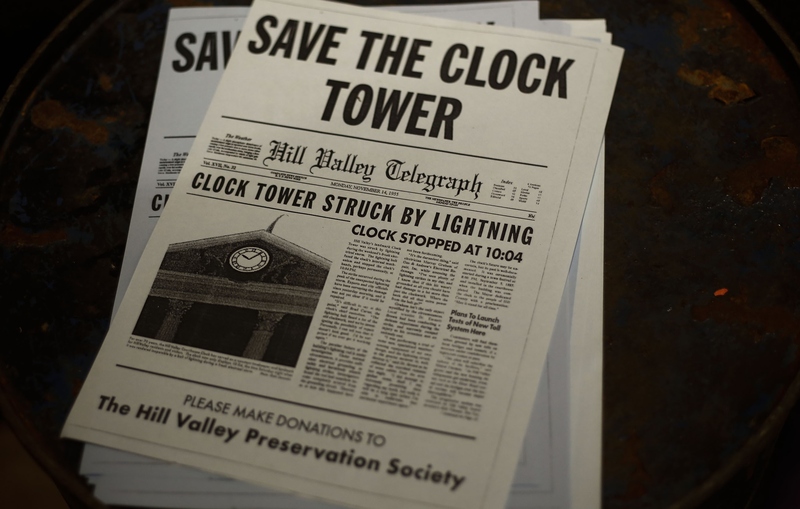 To coincide with the Washington West Film Festival and Back to the Future day, Reston, a suburb of Washington D.C., is going to become Hill Valley! Although the name change will only be in effect for five days, it's still a major commitment to become Hill Valley for that amount of time. And, what better way to celebrate film than by honoring Back to the Future? 11. The White House Is Celebrating Too! You know something's important when The White House is involved. According to their official website, The White House is marking Back to the Future day by making it an official day, and hosting conversations with innovators from all over America. They're also posing the question "What does 2045 look like?" and giving everyone the chance (even you!) to message them about how you think the next 30 years will pan out. How amaze is that?! It seems way too soon to be celebrating Back to the Future day. How can the first film be 30 years old already?! Even though the day will soon be over, though, Back to the Future will always be timeless.